Manet did not consider himself an Impressionist. His style of art preceded the Impressionist movement and was more realistic, especially in his early work. Most notably, Manet focused on figure painting, never becoming a landscape artist. Another large difference between the two artists is their response to war. Even though Monet had a son as a soldier in World War I, no note of sorrow even touches his paintings. Looking at his paintings, all could have been prosperous and well in France. Manet painted images of war, including Battle of the Kearsarge and Alabama, 1864. However, his paintings did have many impressionistic aspects. Many critics who preferred more realistic styles denounced Manet’s pictures as sketchy. Some even went as far as to say paintings like Music in the Tuileries were unfinished. This style is seen in the landscaping, which is almost impressionistic. 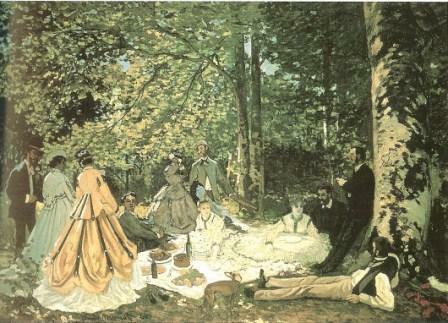 Manet also did some work where he did not paint realistically. His Self-portrait with Palette, 1879, uses a blending of many blocked browns in his jacket. It shows major brush strokes.